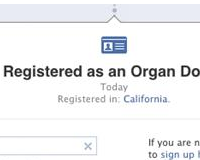 In order to increase the awareness about organ donation, Facebook announced yesterday a new function for users to show in their Timeline that they are donors, in case they are. Besides sharing the status, the new function includes a space for users to tell when and why they decided to become an organ donor and a link to their state or national registry in case they want to register as such. Once selected, the donor status will be showed in the Timeline and in the about section of the user in question, who will also be able to control the audience for that information.